Think the market is too complacent about this weekend’s election in France? Worried that the euro area is going to crumble under the weight of Italy’s struggles? Convinced that Greece, Portugal or Spain are just one more kicked can away from a disaster? As of tomorrow, investors in the U.S. will have another way to translate these ideas into actionable trades with tomorrow’s launch of two new exchange-traded notes (ETNs) – EVIX (long euro zone volatility) and EXIV (inverse euro zone volatility) – from VelocityShares and UBS that put a European face on existing U.S. VIX-based products such as VIIX and perennial favorite XIV. The beauty of EVIX and EXIV is that these products create so much flexibility for investors who maintain a global, cross-asset class view of volatility. In the run-up to the first round of the French election, for example, VSTOXX spiked dramatically and pushed the VSTOXX:VIX ratio below 1.00, creating some interesting arbitrage opportunities and/or pairs trades in the process. Now investors can trade euro zone volatility against U.S. volatility, use targeted hedges for risk that is specific to the euro zone or speculate more easily about the direction of volatility in the euro zone. I encourage everyone to study the EVIX and EXIV prospectus closely. This is a huge development in the volatility space and if options on EVIX and EXIV follow later this week, as expected, the volatility trading landscape will be much richer and more diverse. Now if we can only get liquid volatility products for gold volatility (GVZ) and crude oil volatility (OVX), I won’t even have to set out a stocking next to the chimney this Christmas. While I’m at it, why are there no options on XIV? This is such a popular high-beta product that it deserves options so traders can express a broader range of opinions on volatility. Readers, it never hurts to nudge the CBOE on these issues. An outpouring of popular sentiment can make a difference. As the risk of charging off into full rant mode, I feel compelled to say that I hope volatility investors know a good thing when they see it. It is a shame that VXST futures did not attract enough attention to hang around and that VMAX and VMIN are not trading with higher volumes. One of the best volatility products ever created, ZIV, nearly died of neglect before investors finally paid it some attention. As I see it, EVIX and EXIV as well as VMAX and VMIN are test cases for the future of the breadth of volatility products. If you would like a diverse tapestry of volatility products in the future, it would not hurt to “buy local” volatility ETPs rather than sticking to the handful of already successful products. If you don’t vote with your feet, you had better be happy playing in a small and rather limited sandbox. I am fond of saying, “In volatility, there is opportunity!” – but that opportunity is a function of the richness of the various volatility product platforms. Where and When Will the Euro Bottom? Disclosure(s): net short VXX and VMAX; net long XIV and ZIV at time of writing. The CBOE is an advertiser on VIX and More. Ten years ago today, we witnessed that largest one-day VIX spike in the nearly three decade history of the VIX. On that day, the VIX rallied from a prior close of 11.15 to 18.31 – a 64.2% gain. The move came in conjunction with a 3.5% decline in the SPX (large, but nothing like what would follow during the next two years) and followed overnight concerns related to the Chinese government raising interest rates to discourage speculation. The fears in China were largely responsible for a 8.8% loss in the Shanghai Composite Index and a 9.9% loss in the FTSE/Xinhua China 25 index that is the basis for the popular Chinese ETF, FXI. In retrospect, the biggest VIX spike of all was a short-lived phenomenon whose fundamental and technical underpinnings turned out to pose no lasting threats. As is often the case, traders who faded this move (and keep in mind there were no VIX ETPs available at that time) and bet on mean reversion cleaned up on that trade. So, did this move in 2007 provide a hint as to what would follow in 2008? As I see it, the timing was merely a coincidence. 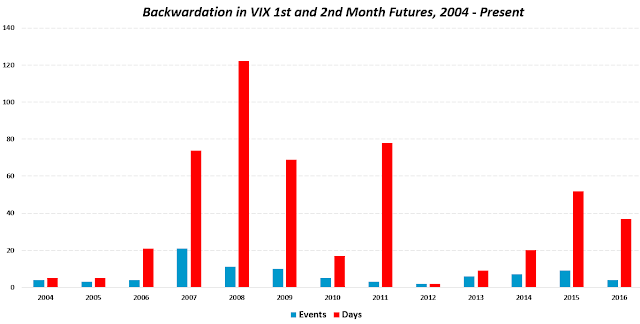 It may not be a coincidence, however, that the biggest VIX spike in history helped to usher in the golden era of VIX spikes, with 15 of the top 22 one-day VIX spikes of all time having occurred during the past decade, as is reflected in the graphic below. Of course, most of the spike in VIX spike activity was the result of the Great Recession and some of the “disaster imprinting” that followed such a severe shock to many investor psyches. Some may look around at a VIX that is not too much different now than it was a decade ago and wonder what it might take to trigger another 64% jump in the VIX. Certainly there is a huge policy uncertainty overhang at the moment, lots of political (and related economic) uncertainty in Europe and there are always some black swans lurking just out of our sightlines. For now, however, will just have to live with that eerie, unsettling feeling that often accompanies low volatility and wait for another bump in the night before we reassess the volatility landscape. I often get asked about where to go to learn more about the VIX and volatility. Well, if there is one event each year that falls in the absolutely-do-not-miss category, it is the CBOE’s annual Risk Management Conference, which is back in Dana Point, California this year from March 8-10. It should be noted that while this is the 33rd annual incarnation of this event in the U.S., in the past few years, RMC-Europe (September 11-13, 2017 in Hertfordshire, U.K.) and RMC-Asia (December 5-6, 2017 in Hong Kong) now give VIX aficionados three different opportunities to gather around the globe and immerse themselves in all things volatility. Also, Ed Provost, President & Chief Operating Officer, CBOE Holdings, Inc. will be there to kick off the proceedings and if history is any guide, this is when we are most likely to get some insight into any upcoming or recently launched CBOE products. For more information, check out the full agenda or register here. While the RMC content is guaranteed to be world class, this is also the greatest gathering of volatility practitioners, academics and other manner of VIXophiles that I am aware of. In short, if you speak VIX and are looking to find your lost tribe, here they are. This is why I like to informally refer to the RMC as The VIX Summit. While the CBOE has provided excellent coverage of this event on Twitter and on the CBOE blog, I will do what I can to pass along real-time and near real-time commentary as well. I must admit that one of the most interesting conversations I have ever had on the VIX was at with the creator of the product, Robert Whaley, who regaled me with some interesting stories related to the origin of the VIX at the 2015 CBOE RMC. I trust this year will deliver some equally compelling memories. Last but not least, if you see me this year, please stop and say hello. 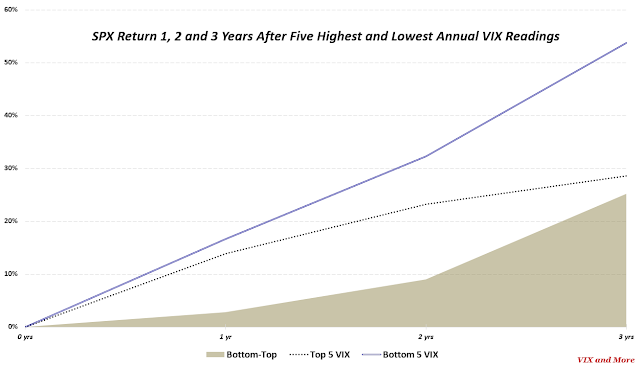 Best VIX/Volatility/Risk Conference of 2013? 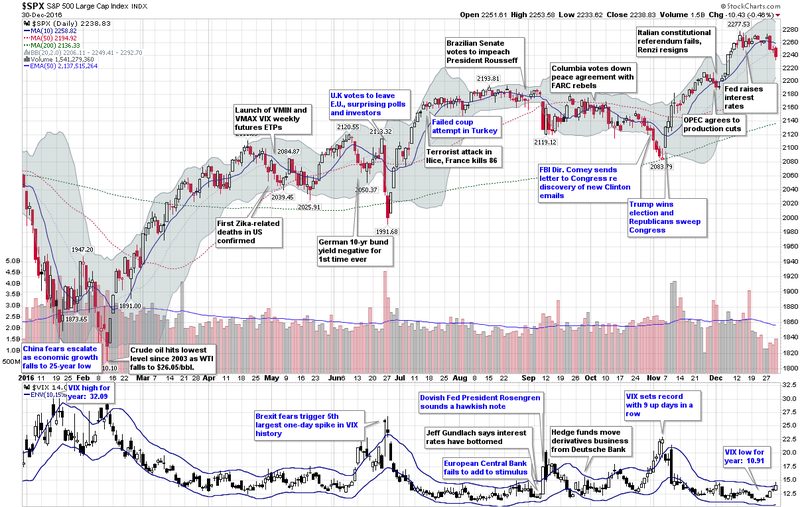 Last week, my Putting Low Stock Volatility to Good Use (Guest Columnist at Barron’s) triggered a bunch of emails related to the clustering of low volatility. Most readers expressed an interest in the phenomenon of volatility clusters occurring in both high and low volatility environments and were curious about the differences between high and low volatility clusters. When it comes to measuring volatility clusters I am of the opinion that realized or historical volatility is a more important measurement than implied volatility measurements, such as is provided by the VIX. When I think in terms of VIX spikes, I generally focus on two single-day realized volatility thresholds: a 2% decline in the S&P 500 Index and a 4% decline. The graphic below is in many respects the inverse of the graphic in Putting Low Stock Volatility to Good Use (Guest Columnist at Barron’s) – and this should come as no surprise. Simply stated: while both high volatility and low volatility cluster in the short-term, volatility regimes tend to persist for several years, so it is very rare to see a clustering of high and low volatility in the same years. This is exactly the principle I laid out more than ten years ago regarding echo volatility in What My Dog Can Tell Us About Volatility. Note also that in spite of all the talk in the past few years of the potential implosion of the euro zone, a hard landing in China, central banks across the globe creating the seeds of our destruction, increasingly bipartisan politics creating deep divides across the nation, etc., etc. – volatility has been relatively mild during the past 5-6 years. The interesting thing about volatility regimes is that they eventually transition from low volatility environments to high volatility environments and vice versa and create what I call VIX macro cycles in the process. The volatility transition phases are some of the most interesting times in the market and can certainly be some of the most profitable. These inflection points are sure to be a target of some of my future writing on volatility. So, as VIX and More sails off into its second decade of publication, I vow to flesh out some of my evolving thinking on subjects I have touched upon above (some of which have lain dormant in this space for several years) at the same time I charge off into new areas. While I will continue to have a laser focus on volatility (particularly its global, multi-asset class aspects), it is time to pay more attention to the “and More” portion of this title of this blog and make a push into new frontiers. Said another way: my thinking likes to cluster, but it likes to spike as well. Finally, most posts tend to touch on one or two key ideas, so I typically put a half dozen or so links below that I refer to as “Related posts.” Today, it seems as if I have touched briefly on so many subjects that more links (I’m sure today’s is a new record) seem appropriate and instead of referring to these as related posts, they are now officially Further Reading going forward. Enjoy! Was 2007 the Beginning of a New Era in Volatility? On Saturday, I posted Putting Low Stock Volatility to Good Use (Guest Columnist at Barron’s) and used that opportunity to expand upon some of the points I raised in my February 18th column for Barron’s. 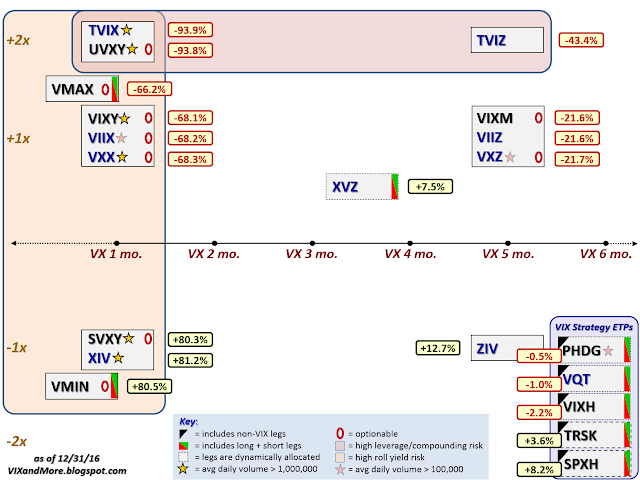 Specifically, I addressed the issue of the clustering of low volatility and used a graphic to show that when the VIX closes below 12, it tends to persist in these low readings, clustering for several years, before remaining above 12 for even longer periods during high volatility regimes. Now there are two ways to compare percentages and the best way for me to illustrate this is with an example. If we are comparing 5% with 4% is the 5% value 25% higher than 4% or is it 1% higher? You can make a case for either comparison, one of which is made with division and is more of a pure percentage calculation, while the other which is made by subtraction and is perhaps best thought of in terms of percentage points. In the Barron’s article, I used the division/percentage method, which is the norm when comparing numbers that are not percentages in and of themselves. This time around I will try to minimize confusion and use the subtraction/percentage points approach instead. 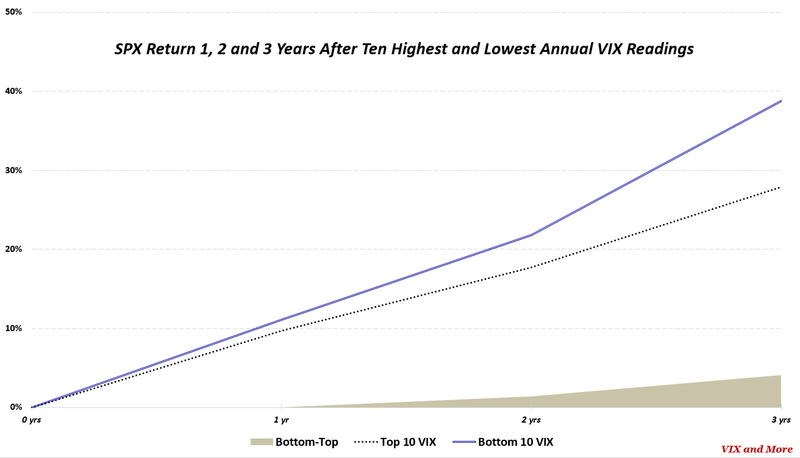 In the first of the two graphics below I have calculated the SPX 1-year, 2-year and 3-year returns following the years with the five highest average VIX values (2008, 2009, 2002, 2001 and 1998) with a dashed black line as well as the years with the five lowest average VIX values (1994, 1993, 2006, 2005 and 1994) with a solid double blue line. In all three time frames, the better returns followed the lower VIX readings and I used a green area series to show the (percentage point) difference. For comparison purposes, in the second graphic below I have plotted the same SPX 1-year, 2-year and 3-year returns following the years with the ten highest average VIX values as well as the years with the ten lowest average VIX values. Once again, in all three time frames, the better returns followed the lower VIX readings, though in this instance the performance gap between the lower VIX readings and higher VIX readings is somewhat reduced. I offer up these graphics because I maintain that there are many skeptics regarding not only the persistent clustering of low VIX readings, but also related to the lack of robust data showing the effect of mean reversion during low volatility regimes. 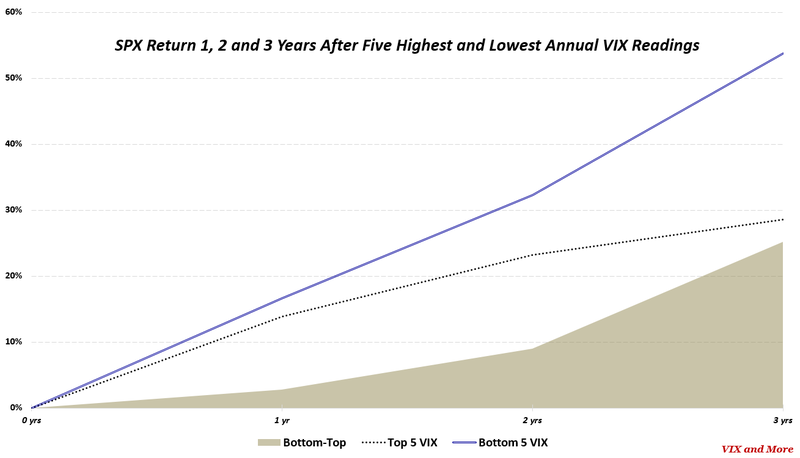 As I have noted previously, mean reversion is much more predictable and tradeable following a VIX spike than after a significant decline in the VIX. How Low Can the VIX Go? Where Will the VIX Bottom? With spring training just getting underway in Florida and Arizona, I think it is appropriate that I once again have an opportunity to pinch hit for Steve Sears in his The Striking Price column for Barron’s. Today’s column is called Putting Low Stock Volatility to Good Use (my title suggestions always seem to end up on the cutting floor) and builds upon some of the ideas I presented three years ago in Low Volatility: How to Profit from a Quiet VIX. If my memory is correct, this is the twentieth time I have been a guest columnist at Barron’s in this fashion and in keeping with tradition, I always try to make the column topical, particularly when there are some aspects of volatility that have investors more perplexed than usual. Lately, it has been the persistent low VIX readings (including the first sub-10 VIX print in a decade) in conjunction with a new administration and extremely high policy uncertainty that has been difficult for investors to digest. While I too have dedicated a fair amount of effort to square low volatility with high policy uncertainty, my research related to volatility has made it easier to stick with the trend instead of trying to anticipate a market turn. As Barron’s is not necessarily the best place to try to shoehorn original research into a short column, I thought I could use this space to expand upon some of the points I made. 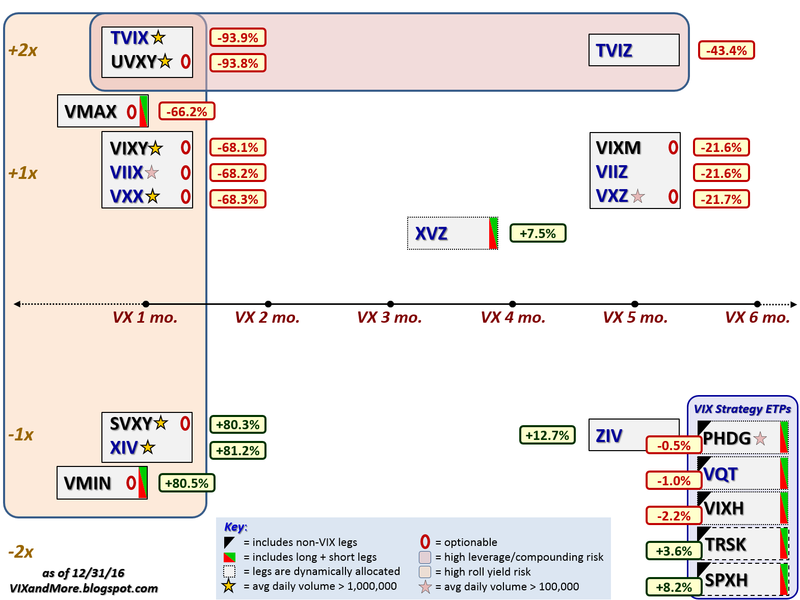 Specifically related to the clustering of low volatility, the graphic below shows that when the VIX closes below 12, it tends to persist in these low readings, clustering for several years, before remaining above 12 for even longer periods during high volatility regimes. A corollary to the above is that while investors often focus a good deal of their VIX analysis on mean reversion, it is important to note that mean reversion is much more predictable and tradeable following a VIX spike than after a significant decline in the VIX. There are some other interesting statistics and ideas in the Barron’s column that I will address in other posts shortly, not the least of which addresses the performance of the SPX in the years following extreme high and extreme low VIX readings. Stay tuned. Finally, since I enjoy being a pinch hitter so much, I thought I might highlight one pinch hitter for every new Barron’s column I write. This time around I’d like to put the spotlight on Rusty Staub, who just happened to be at the zenith of his pinch-hitting duties when I moved to New York. In the twilight of his career, the charismatic Rusty tied a National League record in 1983 with eight consecutive pinch hits and also tied the Major League record with 25 RBI from those (24) pinch hits. Rusty finished his career with exactly 100 pinch hits and is currently 19th on the all-time pinch hit list. I realize I have a long way to go to get to Rusty’s rarefied air, but 100 pinch hits is something to shoot for. Last year I shocked quite a few investors and media outlets with the publication of Every Single VIX ETP (Long and Short) Lost Money in 2015. My intent was not to tar and feather the VIX exchange-traded products landscape, but to highlight the fact that in an environment characterized by sharp VIX spikes and other volatility extremes, the power of volatility compounding price decay can overwhelm both long and inverse ETPs. In sharp contrast to across-the-board losses in 2015, the performance of VIX ETPs in 2016 was much more balanced and in line with historical norms. While there were some sharp VIX spikes, the combination moderate volatility, above-average contango and persistent mean reversion translated into a sharp down year for the long VIX ETPs and a strong up year for the inverse VIX ETPs. The more complex multi-leg, long-short and dynamic VIX strategy ETPs were closest to breaking even for the year, with half of these posting modest gains and half posting small losses. In the graphic below, I have plotted the performance of all twenty VIX-based ETPs with respect to leverage and maturity, using leverage on the y-axis and maturity on the x-axis. This group includes five VIX strategy ETPs that have no easily discernible point on the leverage-maturity grid. Depending on how finely you wish to split hairs, these twenty ETPs account for anywhere from fourteen to eighteen unique ways to trade volatility long and short, across various maturities and according to a wide variety of strategic approaches. On the plus side, while both XIV and SVXY were up over 80% during calendar 2016, this performance falls short of the 2012 and 2013 numbers, where each ETP gained more than 100% in both years. Similarly, while losses of over 93% for UVXY and TVIX must sound like a worst-case scenario for these two products, losses were over 97% in 2012 and just slightly better – at -92% – in 2013. In terms of consistent winners, while their numbers have been more modest, the most consistent gainers in the VIX ETP space have been ZIV, TRSK and SPXH. Two new VIX ETPs entered the fray in 2016: VMIN and VMAX. While these products have not yet attracted the interest of investors that I believe is warranted (VMAX and VMIN Poised to Be Most Important VIX ETP Launch in Years), there is still time for investors to discover these products. For the record, VMIN was launched on May 2, 2016 and outperformed both XIV and SVXY from the launch date until the end of the year, racking up an impressive 80.5% return in just eights months of trading. Going forward, I would expect VMIN to regularly be the top performer in any period in which the inverse ETPs post positive returns. For those who may be wondering, the VIX index was down 22.9% for the year, while the front month VIX futures product ended the year with a loss of 18.3%. As is typically the case, contango was a significant performance driver during the course of the year. Contango affecting the front month and second month VIX futures averaged a relatively robust 8.3% per month during the year (the highest since 2012), while contango between the fourth month and seventh month was slightly above average at 1.8% per month. As an aside, for those who may be wondering, the flurry of recent posts is not an anomaly. There is a lot to be said about the VIX, volatility, ETPs, market sentiment and many of my other areas of interest. With the the-year anniversary of the VIX and More blog just three days away, this seems like a good time to dive head first back into the fray. Will TVIX Go To Zero? Two days ago, in The Year in VIX and Volatility (2016), I made no mention whatsoever of the VIX futures term structure. Traders of the full range of VIX products (futures, options and ETPs) hopefully know by now that the entire VIX product landscape is based -- and priced -- off of VIX futures and one of the most important aspects of VIX futures is the shape of the term structure. Long story short: as the graphic below shows, the 2016 VIX futures term structure (double red line) was closer to its historical average (wide gray line) than any prior year since the launch of VIX futures in 2004, with the average term structure over the course of the year demonstrating a relatively modest upward sloping term structure, also known as contango. By way of explanation, the graphic above shows the average (mean) normalized term structure for each year since the VIX futures were launched. In normalizing the data, I have set the average front month VIX futures contract to 100 and have expressed the averages of the second through seven months as multiples of the front month. Note that the terms structure lines are dotted and somewhat wavy for 2004 – 2006, due to the fact that the CBOE did not implement a full complement of consecutive monthly futures until October 2006. In terms of takeaways, since I have not posted this graphic in two years, note that the term structure for 2015 was slightly flatter than average. Looking back a couple more years, note that 2012 and 2013 saw the steepest term structure on record. In the thirteen-year history of VIX futures, only two years saw a downward sloping term structure, also known as backwardation: 2008 and (barely, depending upon how one measures) 2009. During the course of 2016, the VIX futures term structure moved into backwardation on four separate occasion and closed in backwardation on a total of 37 days – with 31 of those 37 days running consecutively from January 4th to February 16th. These four instances and 37 days are just slightly below the average year, as can be seen in the graphic below. Last but not least, the average term structure for the year as well as the frequency and magnitude of the contango-backwardation dance is a strong determinant of the annual performance of the VIX ETPs and in my next post I will detail why 2016 was unlike the previous year, where Every Single VIX ETP (Long and Short) Lost Money in 2015. VIX Futures: What Were/Are They Thinking? The consensus called for a big uptick in volatility in 2016 and while there was a lot of drama, the VIX spikes were relatively manageable and short-lived. The VIX opened the year at 22.48 and ended the year at just 14.04. For the full year, the median VIX was 14.31, while SPX historical volatility for the full year ended up at a mere 13.12. In all five instances, the VIX moved up sharply, but in defiance of historical precedent, the volatility index moved down almost as sharply as it moved up. In fact, some of the biggest extremes for the year came in the form of volatility crushes, where the VIX had an unprecedented series of sharp downward one-day move. Checking the record books, the only previous year that the VIX posted three top 20 one-day declines was 2007 – and clearly investors were in denial that year. This year the Trump election caused the sixth largest one-day drop in the history of the VIX, whereas the Thursday before and Tuesday after the Brexit vote triggered the eighteenth and tenth largest one-day VIX declines. On the other side of the ledger, some of the upward moves in the VIX made the record books as well. The day following the Brexit vote saw a 49.3% VIX spike – the fifth highest one-day spike on record. What was even more surprising was the Rosengren/Gundlach/ECB cocktail noted above triggered a 39.9% spike (eleventh highest in history) in what seemed to be a relatively calm market environment in September. It turns out the VIX was just getting warmed up for greater things, including a record nine consecutive up days leading up to the November election. Even with these extremes, the highs and lows in the VIX were rather middling, with the VIX peaking at 32.09 on January 20th and hitting an annual low of 10.93 on December 21st. Included in the non-VIX highlights are a 5000+ year low in interest rates in Europe and Japan (where negative interest rates prevailed) as well as a thirteen-year low in the price of crude oil. On the geopolitical front, political craziness of one kind or another abounded in Brazil, South Korea, Turkey, Italy, Colombia and South Africa, among other locations. Terrorism also left its footprint again in 2016 and Zika also created considerable political and social turmoil. In the financial realm, European banks had a very difficult year and begin 2017 on shaky footing. While the year ended on a relatively quiet not, I suspect 2017 will have much more in the way of new surprises, including swans of many dark hues. Next week I will resume the VIX and More fear poll and find out what the consensus is for volatility and its causes in the coming year. Finally, since 2011, I have been maintaining a proprietary Macro Risk Index that measures volatility and risk across a broad range of asset classes, including U.S. equities, foreign equities, commodities, currencies and bonds. In 2016, the Macro Risk Index was trending down most of the year, punctuated by significant spikes in February (crude oil) and again in June (European currencies). How did 2016 measure up to expectations? I sum up the year in My Low Volatility Prediction for 2016: Both Idiocy and Genius. Also worth investigating are a pair of Barron’s articles from one year ago laying out two opposing perspectives on volatility in 2016. For the case for rising volatility and what to do about it, try Jared Woodard’s Prepare for Rising Volatility in 2016. I provide the contrarian point of view in The Case Against High Stock-Market Volatility in 2016. Have a happy, healthy and profitable 2017! A year ago, Steve Sears of Barron’s asked me to pen a guest column for The Striking Price and use the opportunity to opine on how I saw the volatility landscape unfolding in 2016. Without thinking about it too much, I was fairly certain I was going to devote the column to the many threats that had the potential to spiral out of control during the course of the year, but before I had an opportunity to start translating my thoughts into writing, other pundits started weighing in with their predictions for 2016 and without exception, everyone who ventured a guess on the direction of volatility was adamant that volatility would be substantially higher in 2016 than 2015. “Looking at all the market predictions for 2016, one thing is certain: Almost all of the pundits agree that volatility will be up, making a bet on rising volatility one of the year’s most popular trading ideas. But, as is the case with much of the investment landscape, when most of the pundits agree about how the future will unfold, it pays to investigate the contrarian point of view. Then came January. For those who have tried to put it out of their memory, January was one of the worst first months on record, with the S&P 500 Index falling 7.3% for the month. The bearish trend continued into February, as fears related to China and crude oil had investors selling en masse. By the time stocks found a bottom on February 11th, the S&P 500 Index was down 11.4% -- by some measures the worst beginning for stocks in history. Volatility, of course, was spiking and the VIX had already topped 30.00 on three separate occasions just seven weeks into the year. My prediction of lower volatility: complete idiocy. But the year was not over and we still had to grapple with Brexit, the crazy and unpredictable election season in the U.S., a Fed interest rate hike and persistent political turmoil in places like Italy and Brazil. Amazingly, stocks showed a tremendous amount of resiliency and all the VIX spikes were given the Whac-A-Mole treatment as VIX mean reversion emerged as a key theme during 2016. Now that the year is (almost) in the books, it turns out my contrarian low volatility prediction was spot on and the rest of the pundits ended up on the wrong side of a crowded losing trade, assuming one was patient enough to take a full-year perspective. Genius? Probably not, but definitely more right than wrong, despite my having to wear a dunce cap for the first two months of the year. The graphic below shows the annual average VIX and historical volatility going back to 1990. Note that while the average VIX fell from 16.67 to 15.83 this year, there was an even larger drop in realized or historical volatility, which fell sharply from 15.53 to 13.14. As far as takeaways are concerned, there is the obvious lesson regarding the herd mentality and crowded trades. Additionally, there are also issues regarding how investors frame a problem or potential problem. For example, when one expects an increase in volatility they are more likely to be overprepared for that development and/or overreact when there are initial signs of an increase in volatility. Ironically, if investors load up on SPX puts or VIX calls, then this makes it much more difficult for panic to filter into the market. This leads to a theme that has been repeated often in this space: VIX spikes are notoriously difficult to predict and it is also more difficult to anticipate a change in volatility regimes than many believe. Last but not least, as the graphic above shows, predictions of future volatility almost always overshoot realized volatility, which is why in the last 27 years only the extreme turmoil in 2008 saw realized volatility higher than the VIX over the course of a full year. As for 2017, when it comes to volatility, expect the unexpected. What kind of VIX is appropriate for the Trump Administration? For investors in general and volatility traders in particular, this is one of the more interesting questions going into 2017. Should the VIX be higher or lower in the context of a Trump Administration relative to the Obama Administration? How much economic policy uncertainty is there in Trumponomics? How will various geopolitical issues wax and wane in the context of a Trump-Tillerson foreign policy agenda? While these questions are difficult ones, what is not difficult is looking in the rear-view mirror for some historical context, so that is exactly what I did, calculating the historical volatility for each presidency going back to the Hoover Administration. In order to take advantage of stock data prior to the 1950s, one has to make use of the DJIA rather than S&P averages. While VIX data is even more interesting, the VIX was not launched until Bill Clinton’s inauguration and historically reconstructed data from the CBOE only extends back to George H. W. Bush’s presidential term. The results of the number crunching are included in the chart below and show Herbert Hoover’s historical volatility of 42.87 more than double that of the runner-up, Franklin Delano Roosevelt who posted a historical volatility of 20.88. The only other president to top the 20 level in terms of historical volatility was George W. Bush at 20.28. At the other end of the spectrum, the least volatile presidency was that of Lyndon B. Johnson, where HV averaged an amazingly low 9.12. Following LBJ on the low end are Dwight Eisenhower at 10.70 and Harry Truman at 12.20. Among recent presidents, three of the last four presidencies (George W. Bush is the exception) have seen middling volatility, with Barack Obama 6th of 14 as of today’s data, while Bill Clinton is 7th and George H. W. Bush in 8th place. Since the eye canot help but see trends and patterns whether they exist in real life or not, I am obliged to observe that since the LBJ presidency there is a pattern of higher highs and higher lows. Could volatility by presidential term be trending up? I am certainly not ready to go that far. In terms of key takeaways, it is worth noting that the median historical volatility (combining data from Bill Clinton and George H. W. Bush) indicates that a middle-of-the-road presidency can expect historical volatility of 14.65 and a VIX of 18.91. As far as the VIX is concerned, the 18.91 number aligns nicely with current VIX futures quotes for May and June 2017.